Lala Lajpat Rai was an Indian author and politician who is chiefly remembered as a leader in the Indian fight for freedom from the British Raj. The freedom fighter was popularly known as Punjab Kesari (The Lion of Punjab). 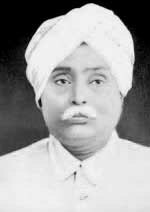 Lajpat Rai was one of the most important nationalist leaders from the Punjab, where he is remembered reverently by Hindu nationalists today. He was a key mentor of nationalists like Bhagat Singh and Chandrasekhar Azad. His love for service was insatiable. He founded educational institutions. He befriended the suppressed classes. In the political field he was indispensable. Lala Lajpat Rai's supreme sacrifice came when he led a procession in Lahore on Oct 30, 1928 to boycott the Simon Commission. The procession was sought to be broken up by the police and Lajpat Rai received lathi blows. While Lalaji tried his level best to keep the demonstration peaceful, the police targeted him and wounded him on his chest. The people were enraged at this insult and held a meeting the same evening. Lalaji, though in intense pain, gave a speech and declared "...every blow aimed at me is a nail in the coffin of British Imperialism....". Wow, this is amazing. The foundations for the fall of imperialism. Thanks for the post!